I’m not sure quite how it happened, by the workshop here at Mombee is overrun with these little green bottles. It’s not a bad thing though as we’ve banished those old habits of dragging the bike out the garage without a quick once-over and heading out with a dry and dusty/rusty chain – I do hate the sound of a chain wearing it’s way through the rest of the drivetrain. So we’re getting in the habit of lubing the chain after each outing and wash. Tip – when you lube a chain, drip a drop of the lube onto each pin in the chain. It’s a bit laborious, but it’s way more effective than just pouring oil along the whole chain, which tends to miss getting lube into every link and also wastes a suprising amount of lube. 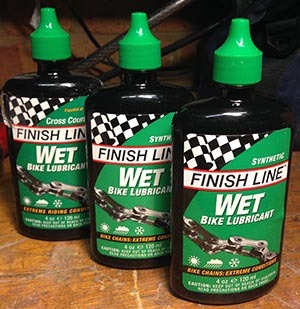 Bearing that in mind the Finish Line Wet lube works really well – it’s very easy to apply, not too thick, not too thin. And then sticks well during extended rides, removing that horrible dry rasping noise… and I’m sure that that makes for less energy expended on a ride.